Wow! Things can really move quickly in the blogging world. Last week, between Needle and Thread Thursday, a tutorial for the Wicked Blog Hop, that "little holiday" that was last Thursday, a tutorial for Benartex, and you know- teaching full time, my head was spinning a little bit trying to juggle the posts and responses to comments, and I wondered whether or not I had bitten off a little more than I could chew in one week! So after all of my scheduled commitments passed, yesterday I was so happy to start a new quilt and finish up this top. I decided to make one that is bright and fun, and gender neutral with shades of blue, green, and bright orange. I purposely chose fabrics that were a little bit clashy, and although I wasn't too sure about it at first, it's kind of grown on me. I think when it gets all quilted I will love it even more. In the midst of all of that last week, another big thing happened to my little piece of the blogosphere. 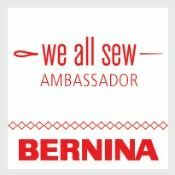 I don't know if you've noticed my new left sidebar, but...I have sponsors now! I thought about this choice for awhile, before finally deciding to take the plunge! Of course, I decided that I would never take on a sponsor that I wouldn't gladly buy from myself, and all opinions on my blog will remain my own. 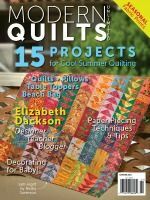 Yesterday, I revealed my newest finished quilt, Blossoms and Butterflies, and introduced you to my very first sponsor, Bumbletees Fabrics. 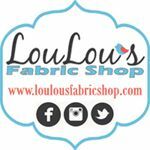 This is my local shop that also sells my quilts. 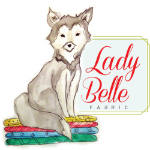 If you missed that post, be sure to check it out, because Bumbletees is kicking off their sponsorship by giving away 5 fat quarters from Heather Bailey's Lottie Da fabric line. 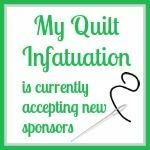 Without further ado, I'm happy to welcome two new additional sponsors, Fat Quarter Shop, and Fabric Tree! 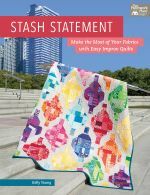 Fat Quarter Shop is a great shop that carries a huge selection of yardage, precuts, patterns, and quilt kits- and they have a whole section dedicated to holiday fabric! Their customer service is great and there is always a bargain to be had in their clearance section! If you need it, there's a good chance they've got it! Fabric Tree is a new discovery for me, but after browsing their shop, I'm certain that I'll be visiting often. With fabric lines like Riley Blake's Enchant, A Merry Little Christmas, Bake Sale, Madhuri, So Happy Together, and Life in the Jungle (and more), there's a lot of selection! They also have a great clearance section, and "Create Your Own Bundle" options in varying quantities. Fabric Tree is offering 10% off all Christmas fabric with the code XMAS10 through the holidays, and I have it on good authority that there are more fantastic coupon codes coming up! I'm so excited to be stepping into this new chapter in my blogging journey! That quilt you're making is really cute :) And congrats again on your sponsors! 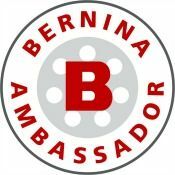 I've been interested in having sponsors, but I'm not really sure where to start. Plus I don't think my blog is "big" enough yet. 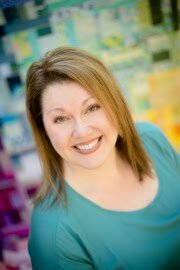 Congratulations Kelly on the new quilt top and the sponsors! How exciting. Congrats and the quilt looks great! Fun times! 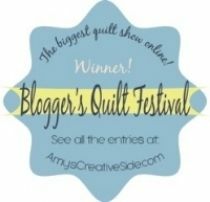 Congrats on the sponsors and the new quilt top! The new 'clashy' quilt top looks great! I've been wondering about sponsors too, but I don't even know where to start. Any hints/tips? Congrats on the sponsors! It just proves that your blog reads honesty and integrity. I feel I can trust your judgement. I also love all three of these shops! Way to go! Congratulations Kelly! There's no stopping greatness. Happy for you! Congrats! You are off and running. Be proud. Congratulations Kelly.....well done you and well deserved. Love the quilt top. Very proud of you! You know I'm a big fan. Congratulations on your wonderful sponsors! Also--Love this quilt! I wish I could do even a quarter of the quilts you complete. I always think I'm going to work on this or that, but it never gets done. I always look forward to seeing your next creation. Thanks for sharing! Congrats! and cute quilt top. Congrats! Lots of good things coming your way quickly! And to top it off another quilt top - oops another wonderful one! love your quilt and congrats on all the new exciting things happening!!! Wow, sponsors!! A big congrats to you Kelly! I love your latest quilt too. That pattern works so well with so many fabrics. Love it! Gorgeous pattern for These fabrics!!! Beautiful quilt and congrats on the sponsors and all your hard work Kelly!! You are busy, busy, busy!! Thanks for sharing.